To view the different logistic sector rankings click on the sector below. Top freight brokerage firms are ranked based on net revenue and include a description of the types of freight handled, plus the number of loads or shipments, if available, for the 12 months ended Dec. 31, 2015, unless otherwise noted, in North America. Top warehousing firms are ranked by total square feet and include the number of warehouses or distribution centers located in North America. 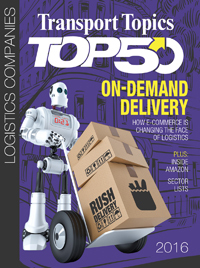 Top dedicated contract carriers are ranked by total power units (tractors and straight trucks) provided for the exclusive use of shippers in North America. Top ocean freight forwarders are ranked by total containers measured in 20-foot equivalent units worldwide. Top airfreight forwarders are ranked by total metric tons worldwide.